« Biscuits and Rhubarb Salad! I am scheduled to teach a rhubarb class this Friday at the Baker’s Pin in Northampton, Massachusetts–and the cooking school there is still looking for people to enroll. If you’re in the area, please consider registering to join us. And if you can’t come, please spread the word. We’ll be making rhubarb favorites from my Pudding Hollow Cookbook, along with some recipes from my forthcoming (next spring, I hope!) book about rhubarb. This entry was posted on Tuesday, May 30th, 2017 at 7:10 pm	and is filed under Rhubarb. You can follow any responses to this entry through the RSS 2.0 feed. You can leave a response, or trackback from your own site. 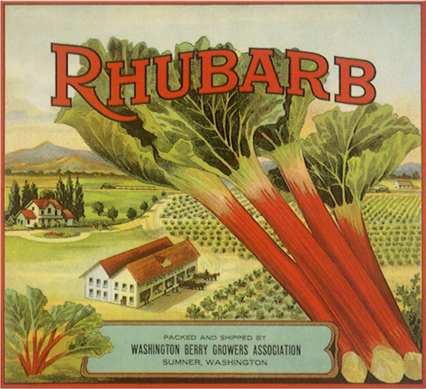 I love this retro Rhubarb advertisement. I have your cookbook in front of me. I made a rhubarb coffee cake last night and have some rhubarb left over. I see your recipe for Rhubarb Tea and thought I might make that today. I have never tasted rhubarb tea but it sounds good! I know you’ll enjoy the tea, Chris; it’s lovely. In fact, it’s one of the things I’ll be making for the class on Friday!